Daily Sahafat is publishing from Islamabad, Lahore, Karachi, Peshawar and Muzaffarabad. It is one of the popular Online Urdu newspaper in Pakistan. It is ABC certified and broad sheet Newspaper. The editor of Daily Sahafat Islamabad is Khushnood ALi Khan. The team of Roznama Sahafat Newspaper represent the Voice of people and makes sure that it is heard by the administrators. Roznama Sahafat has 12 pages and you can purchase by spending 12 Pakistani Rupees. Apart from the national and internatonal news, this newspaper is responsible of covering all the local news. It provides national, international, economics, business, entertainment and sports news. 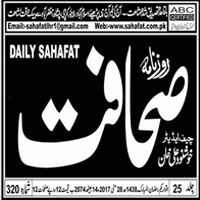 For Those Who Want to Read Daily Sahafat ePaper online they can visit it's Official Website: sahafat.com.pk. At The Website You can read live breaking news as well as daily sahafat yesterday and previous date newspapers too. You Are Visiting Daily Sahafat Page of Epaper.PkNewspapers.com for reading Sahafat Akhbar online.